GLADSTONE -- The Department of Game and Fish captured 277 pronghorn antelope this month on private land in northeastern New Mexico and relocated them to Mexico, Santa Ana Pueblo, a ranch near Grants, and Bureau of Land Management property near San Antonio Mountain. The trapping operation allowed the Department to augment existing herds while removing animals that had been damaging alfalfa fields on the Smith Ranch between Springer and Clayton. The pronghorns sent to Mexico were part of an exchange in which New Mexico will receive desert bighorn sheep rams to expand the gene pool in the captive herd at Red Rock Wildlife Area. Thirty-three of the captured pronghorns were released on Santa Ana Pueblo, 25 went to the Floyd Lee Ranch near Grants and 72 went to BLM land near San Antonio Mountain. Mexico received 147 pronghorns and they were transplanted in three areas: 68 to Valle Columbia, Coahuila, 55 to Rancho Pilares, Coahuila, and 24 to Rincon de la Madera, Nuevo Leon. A helicopter was used to herd the antelope into a large funnel trap, a technique developed by the Department in the 1930s, when crews herded the animals with horses and automobiles. More than 60 people were involved in the capture March 8-10. The effort included erecting four miles of fencing, some of which will remain on the ranch as a permanent barrier to keep pronghorns off the alfalfa fields. Department wildlife biologists and participating veterinarians said they were pleased with an extremely low mortality rate during the operation. 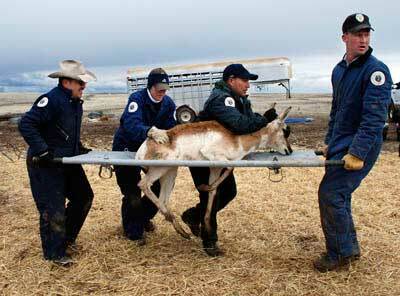 Only eight pronghorns died as a result of injuries or stress from trapping and transit operations. Each animal received a health check, ear tags and some were fitted with radio collars before they were transported in trailers to their new homes. Northeast: 4 p.m. April 6, Santa Fe Bureau of Land Management office, 301 Dinosaur Trail, Santa Fe. Central: 1 p.m. April 13, Department of Game and Fish office, 3841 Midway Place NE, Albuquerque. Northwest: 1 p.m. April 19, Farmington BLM Office, 1235 La Plata Highway, Farmington. Southwest: 9 a.m. April 21 and 22, Black Range U.S. Forest Service office, 1804 N. Date Street, Truth or Consequences. Southeast: 10 a.m. April 24, Sacramento Ranger District U.S. Forest Service office, 4 Lost Lodge Road, Cloudcroft. The program has an annual budget of $800,000 entirely supported by hunters and anglers, who must purchase a $5 Habitat Stamp each year to participate in their sports on Bureau of Land Management or U.S. Forest Service lands. In the 23-year life of the program, $31.3 million has funded 1,998 wildlife habitat projects. In this effort, the Habitat Stamp Program has contributed $15.4 million and federal agencies have spent an additional $14 million in matching funds in the form of cash, costs of planning, fiscal tracking, developing NEPA documentation, and obtaining archeological/cultural clearances. Since 1999, other organizations have contributed $2 million in time and cash to this effort. The New Mexico Habitat Stamp Program has improved more than 624,000 acres of habitat on public lands. Additionally, the program has enhanced 11,000 acres of riparian habitat, built 1,006 places for wildlife to drink water, surveyed 702 wildlife populations and habitats, transplanted wildlife 17 times, improved 79 fishing areas, maintained 6,800 previously built structures, and much more.